Food For Thought OKC Featuring Dr. Imam Enchassi & Charles Gosset by Possibilities, Inc.
Thu, Feb 21st 2019 at 11:30 AM CDT · By Possibilities, Inc.
Local people sparking powerful change in OKC. Spend your lunch hour with engaging & inspiring stories from local people sparking positive change every day. Food For Thought OKC speakers are recorded & produced by Trifecta Communications to help spread inspiration even further. 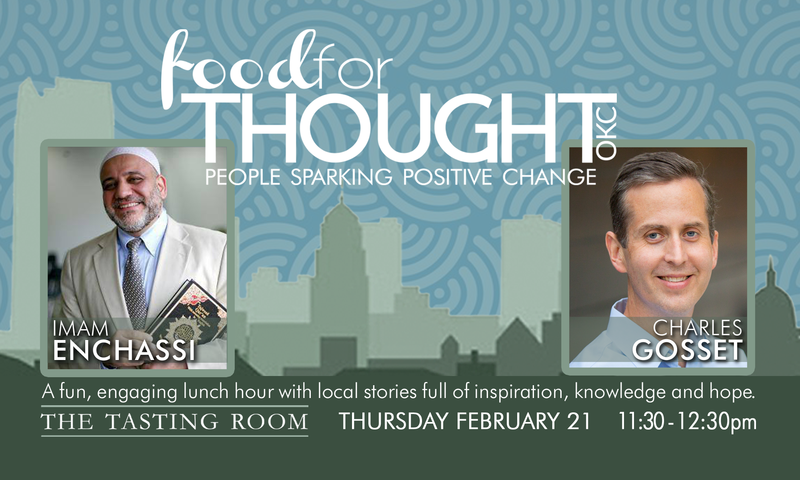 Join us for the next inspiring Food For Thought OKC lunch. Miss our last event or in need of some inspiration? Catch up with our previous speakers on YouTube! Imam grew up in Palestinian refugee camps in Beirut, Lebanon. His experiences as a child surrounded by war and conflict have shaped his passion as an adult for promoting unity and understanding. How can each one of us promote love, peace and unity in our own communities, as well as the greater community we are all part of together? Charles spent years escaping through alcohol & other drugs. In recovery, he found that we’re all escape artists of one kind or another. What we’re really looking for is a way to be ourselves & pull off fewer disappearing acts in our lives. What will it take for you to break the bonds of your own inner escape artist & unleash your purpose in the world? Video production sponsored by Trifecta Communications. Presented in partnership by Possibilities, Inc. and Western Concepts Restaurant Group. Possibilities, Inc. has partnered with Give Lively to securely process your online donation. This transaction will appear on your credit card statement as "Possibilities, Inc.". This transaction is subject to Give Lively's Terms and Privacy.